Climb up the spout again. 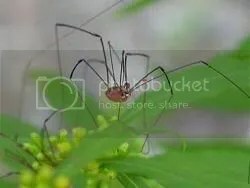 I like Daddy long leg spiders. We see a lot of them in my area, and over the past few weeks we’ve had them in our upstairs toilet. And well, there were two. Now there are six. My mother is terrified of them, and I explained to her very carefully that they are the ‘good’ spiders who eat all the ‘bad’ spiders. (I haven’t told her that they’re highly poisonous, because even though the poison concentration in their bite is nowhere near enough to hurt a human being, she would freak). But now I’m getting slightly nervous that there are more of them. They never seem to move when I’m in there, but they seem to be using my toilet as a little meeting den. Do they discuss which spiders they killed that day? or the giant pale, four-limbed beings that come in and sit on the big white thing? I wonder what they think of us. If they ‘think’. It’s weird (and kinda arrogant) to to assume that we are the only conscious beings on this planet – the only creatures capable of speech and advanced life – but what is advanced? every living creature communicates in some way, what makes us so special? because God decided that we would rule the earth? Hell, cockroaches have been here longer than us. So I leave the spiders alone, but every week there are more and they seem to be moving closer to possibly their ultimate goal: turning my bathroom into the Daddy long leg home.